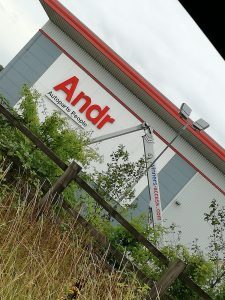 Signs on Andrew Page’s Markham Vale site were being removed this morning as the century-old company transitions into the next chapter of it’s existence. The 100,000 sq ft plus mezzanines depot opened amidst much fanfare in 2012 as the company, then under new management and with new financial backers, sought to modernise nationwide logistics. However, the warehouse, clearly visible from the M1, became redundant following the acquisition of Andrew Page, then in administration, by Euro Car Parts in 2016. Wasn’t this money pit part of the reason the company dwindled. Poorly run from day 1 and a shambles at the planning stage with the blind leading the blind. Looks better as a shed than a warehouse. As pointed out above, the business resembling the Titanic but hopefully ECP provided enough life rafts to get it sailing again. So sad for what was once such a well respected brand / company. Inevitable really though as soon as venture capital gets involved in the aftermarket. So many people just don’t understand – the aftermarket is a budget market, supplying parts to people that in the main own old cars. They own old cars as they don’t have much money. The finance boys stayed well away after the Finelist disaster and even today, the car parts market and car industry in fact still `stinks` in the city. One wonders what is in store for the American money currently sloshing around the three groups that are fighting to become a dominant national. I suspect the ending will be the same for all previous wannabe nationals that all had the same business model of a couple hundred depots, head office, big shed type warehouses. There is no economy of scale. They will not have a cost advantage. They all work on small margins on the big OE brands, thinking they can make up margin with their own brands from China but the market is awash with product from China. And in any case, national distributors are not good at importing. The cost of having the right stock in the right place and the need for skilled staff who are often treated badly by area managers will kill them. The rot already seems to have set in. Its just a matter of time. A great time for good independents though. This was clearly the best Motor factor in the UK in its era and has not been matched since. The staff talent here at its prime was immense. Many of those staff are still in the trade now. After Andrew departed the business in 2010, this ‘titanic’ of the motor factoring sector, sadly hit an iceberg (..or three) leaving it damaged beyond repair. Its a sad end to a shining example of the business success achievable by a great team of people following a great leader. Too true Mike , I left Bramley depot after 20 years at the depot. Shame really. It certainly was the best Factor in the UK, as you have said it sadly changed after Andrew left the business, I still cannot understand why and how the managing directors that were left got it so wrong, why didn’t any of you try and fight back?, why didn’t you tell the finance fat cats that the crazy ideas they were coming up with wouldn’t work?, they might have been fine for retail companies that they had got involved with in the past but not for the motor trade, why didn’t any of you stick up for the rock face staff? why didn’t you pay the rockface staff a decent living wage then you would have retained talent, why did you push special offers when we didn’t have coil springs in stock for a Corsa C or oil filters for a Ford Focus? Could the director’s justify their fat cat salaries? because the majority of the branch staff could justify their pittance many times over, may sound like sour grapes but you Directors have a lot to answer for and I truly hope that you are ashamed of how bad most of you really are at what your supposed to be experts at, pathetic!!! You are correct Mike it did used to be the Finest Factor in the UK aftermarket, but when Andrew left the Directors made a shambles of it. 1. Why didn’t any of the original board of directors carry on with Andrews example of leadership by having a back bone and standing up to the moneymen fat cats? 2. why did the company ‘busy’ itself and its sales staff by flogging special offers when it couldn’t keep basic ‘bread & butter’ items on the shelf i.e Corsa coil springs, focus oil filters etc etc?